Out in my garden recently, I was pleasantly surprised to find several chive plants thriving after a long, rough winter. This was shortly before my husband, Kevin, and I took a quick weekend trip to Toronto to visit our friends John and Karen. I made a mental note to cook up a batch of potato soup when we returned home – tender, tangy chives, along with a little sour cream, are the perfect complement to rich, buttery potato broth. After arriving in Canada, we dined at one of Toronto’s great restaurants, and Kevin ordered a bowl of potato soup. This prompted John to tell a hilarious story about potato soup he had ordered recently (not at the same fine establishment), which had the consistency of mashed potatoes – so thick he could stand his spoon upright in the center of the bowl. John suggested to the restaurant staff they should list only one menu item, let patrons know they could enjoy it either as soup or a side dish, and charge the same economical price as the mashed potatoes! We promptly invited John to visit us in New Jersey, and promised to prepare him a delicious, creamy soup that would be impossible to confuse with mashed potatoes. Not only that, it would be garnished with garden-fresh Jersey chives. Well, our friends haven’t visited yet, but I decided to go ahead and make the soup anyway. Yukon Gold potatoes have the perfect consistency (no mashed potato soup here), and leeks sautéed in butter add a little bite. Funny thing, though, when I returned home from the store with my bag of beautiful, organic, golden potatoes, I noticed the fine print on the bag – product of Canada. Leeks must be cleaned well to remove sand trapped between layers. To clean, trim about ½ inch from root end and discard. Trim about 2 inches from top, green part of leek and discard. Place leek on cutting board and slice vertically down the center. Slice again into quarters. Run the sliced leek under cold running water, fanning out to make sure it is well rinsed. Dry, coarsely chop, and set aside. As an alternate method, trim as above, coarsely chop, rinse and dry using salad spinner. Make sure leeks are dry before cooking. Peel and chop potatoes and set aside. Melt butter in a heavy saucepan over medium heat. Add leeks and sauté about 8 to 10 minutes until soft but not browned, stirring occasionally. Add minced garlic and sauté another 1 to 2 minutes. Add broth, potatoes, salt, pepper, and celery seeds. Bring to a boil. Reduce heat, cover and simmer for about 30 to 35 minutes, until potatoes are cooked through. Puree in a blender or food processor. Serve warm or cold, garnished with a generous dollop of sour cream and sprinkled with chopped, fresh chives. I love to see tiny Israel lit up on my stats and know that you are looking at my recipes! that is just wonderful … if possible, please add some more recipes that uses sweet potatoes. We have farm over here in Kerala and when sweet potatoes are in season, the only thing that we make is mashed potatoes. 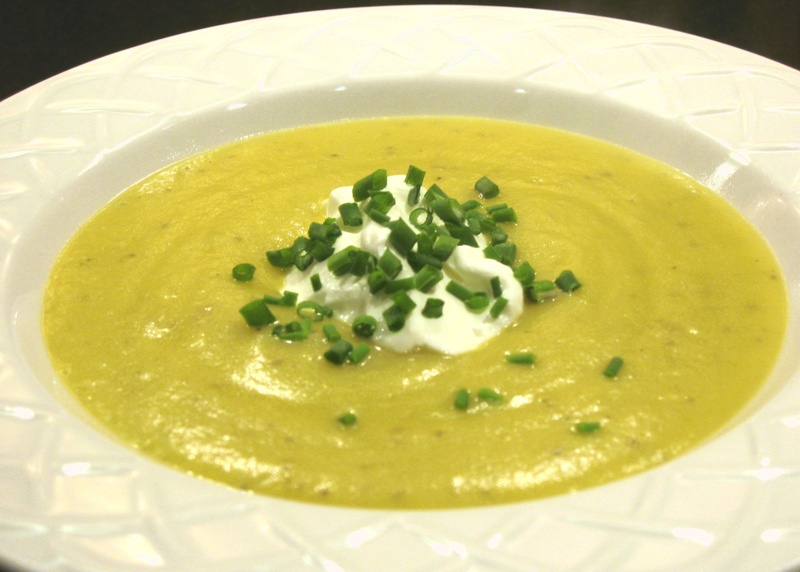 I love potato and Leek soup … have you ever had the cold version known as Vichysoisse? Hey Sybartica, there is a beautiful article in today’s NY Times by Mark Bittman about cold soups. Do you have access to it?